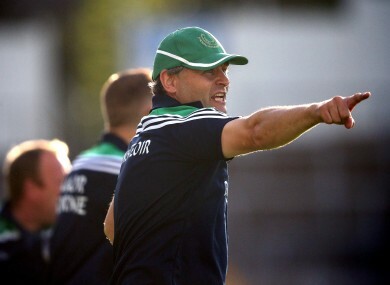 TJ RYAN’S REIGN as Limerick senior hurling manager looks to be over. Ryan stopped short of officially confirming his departure after tonight’s All-Ireland hurling qualifier loss to Clare, but in a passionate post-match address to the media at Semple Stadium, he gave the strongest indication that he is going to depart the position. “I’ve given three years of my life to this job. I’ve given every waking hour. Anybody who’s ever been involved in a management team, anybody who’s ever been involved in inter-county setup, it takes huge time. “It takes massive effort. It’s every day, every minute of every day, phone calls, trying to organise everything, trying to do it to the best of your ability for the county. I’ve given everything as a player and as a manager to Limerick hurling. “I’ve brought it as far as I could. It wasn’t to be, it wasn’t good enough. Without making anything formal, I will probably do that during the week but I’ve taken it as far as I could. “I’ve given it absolutely everything, I genuinely have. I’ve thoroughly enjoyed it, I’m very grateful to the people who have allowed me the opportunity. I’ve nothing but pride for the guys that played for me, the guys that gave everything. “I’ll always thank them and I’ll be grateful for every single effort that everyone made. But for me personally, it just wasn’t good enough. I’ve no problem taking the flak for that. “I’ll sleep on it, think about it over the next day or two. Talk to the people involved and basically just come to a decision. Look what I’ve given it to it time wise for three years, I’ve enjoyed it, but it just wasn’t good enough. Email “'I had a go, it wasn't good enough' - It looks like TJ Ryan's time as Limerick boss is over”. Feedback on “'I had a go, it wasn't good enough' - It looks like TJ Ryan's time as Limerick boss is over”.